[St.James's] Church, Delhi [showing damage caused by the Mutiny fighting]. bl.uk > Online Gallery Home	> Online exhibitions	> Asia, Pacific and Africa Collections	> [St.James's] Church, Delhi [showing damage caused by the Mutiny fighting]. 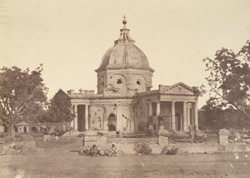 Photograph of St. James's Church in Delhi from 'Murray Collection: Views in Delhi, Cawnpore, Allahabad and Benares' taken by Dr. John Murray in 1858 after the Uprising of 1857. St James Church was commissioned by Colonel Skinner (1778-1841), a distinguished military officer, famous for the cavalry regiment Skinner’s Horse, known as the Yellow Boys because of the colour of their uniform. While lying wounded on the field of battle he made a vow that if he survived he would build a church in thanks for his life being saved. The church was started in 1826 and completed ten years later. During the Uprising of 1857 the Chruch was damaged by shellfire. The dome of the chruch is topped by a copper ball and cross, which was used by sepoys in 1857 for target practice.